Life Coach Anne Greco is back with three popular workshops at the Moorestown Library. Do you often feel that you don’t have enough hours in the day to get things done? The “Time Management for Life — and Sanity” workshop will help you answer why you feel stressed and stretched in a million directions. You’ll learn steps to manage your time so that you gain control of your life. 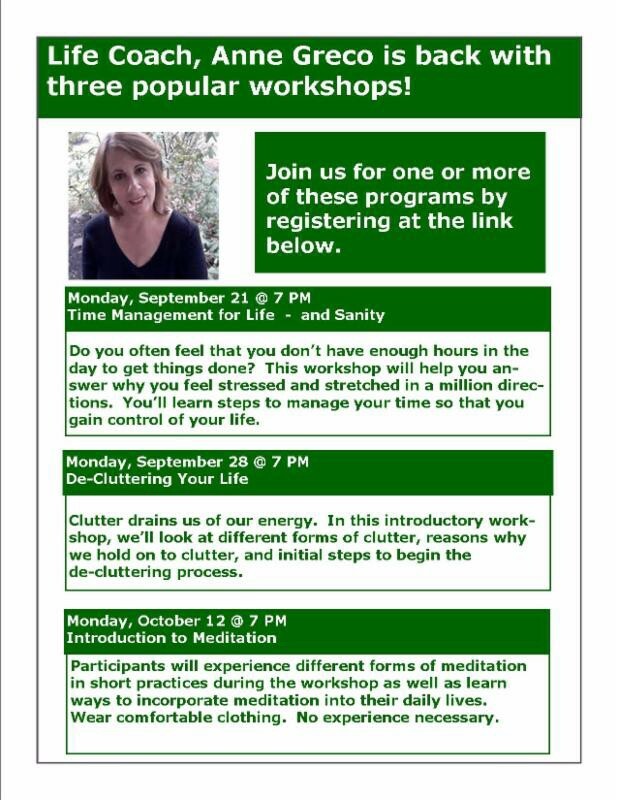 The workshop will be Monday, Sept. 21 at 7 p.m.
Clutter drains us of our energy. In this introductory workshop, “De-Cluttering Your Life,” we’ll look at different forms of clutter, reasons why we hold on to clutter, and initial steps to begin the de-cluttering process. The workshop will be on Monday, Sept. 28 at 7 p.m.
With the “Introduction to Meditation” workshop, participants will experience different forms of meditation in short practices during the workshop as well as learn ways to incorporate meditation into their daily lives. Wear comfortable clothing. No experience necessary. The workshop will be on Monday, Oct. 12 at 7 p.m.
Join us for one or more of these programs by registering at www.moorestownlibrary.org/annegreco.html.